﻿ Spinach Panela Tartlets - Easy Appetizer Recipe! 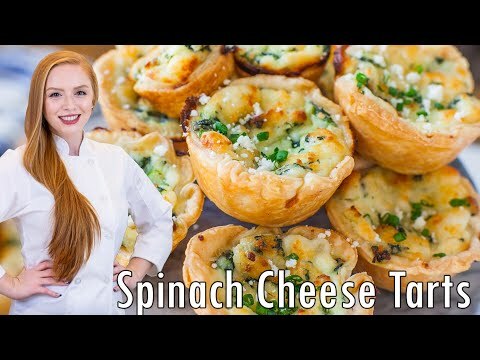 Spinach Panela Tartlets - Easy Appetizer Recipe! Preheat the oven to 375F. Prepare either a 24-count mini or a 12-count regular cupcake pan. Prepare the tart shells: unroll the premade pie crust out over your work surface. Use a rolling pin to roll the dough out slightly thinner. To cut the crust, use a cookie cutter that is slightly larger than the cups in your cupcake pan. Collect the scraps to reuse once. Drop the dough into the pan and press into place using the bottom of a shot glass. Next, prepare the filling. Preheat a large sauté pan over medium heat and add the butter. Once the butter is melted, add the diced onion and minced garlic. Sauté the mixture over medium heat for 4 to 5 minutes, until the onion is translucent but not browned. Season the mixture with salt, then add the spinach. Cover the pan with a lid to wilt the spinach faster. Once the spinach is wilted down, continue cooking it for a few more minutes, allowing the water to evaporate. Remove the mixture from heat and allow it to cool slightly. Meanwhile, prepare the cheese. For the Panela cheese, use 2 forks to break the block into fine crumbs. The Cotija cheese is very crumbly and will crumble easily. Combine the cheeses, spinach and onion mixture, and the egg in a large mixing bowl. Using a spatula, combine everything thoroughly. Use a spoon to fill each tart shell to the top, but do not pack the filling down. Bake the tartlets at 375F. For larger tartlets, bake for 26 to 28 minutes; the smaller tartlets, bake for 20 to 22 minutes. Bake until the crust is golden brown. Allow the tartlets to cool in the pan for 5 minutes, then use a spoon to take them out onto a cooling rack to cool further. Vegan Spinach Dip Crescent Roll Ring - Best Appetizer!!! Easy Mini Fruit Tartlets - Easy Filling Recipe - Simple and Delicious! 5-Minute Spinach Artichoke Dip: Easy holiday appetizer recipe for your Instant Pot!